Twice a year the partners in Perspectivity Enterprise get together for three days to share experiences, plan for the coming year, and spend time with each other. In darkest January all the Partners agreed to travel to Northern Ireland for the summer retreat, given that Michael Donnelly, one of the Partners lives there. 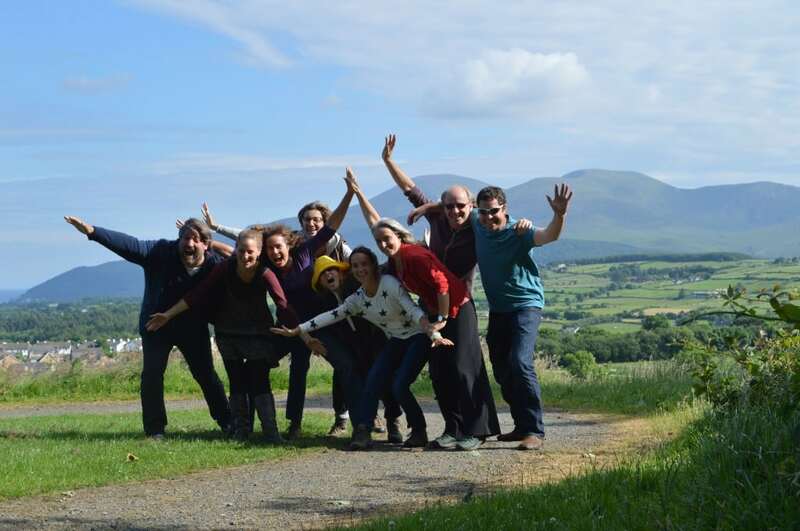 The goal of the retreat was twofold – firstly to spend time in each others company – simply connecting as humans and friends; the second aim was to explore very deeply the motivations and connections that we each have to the work we do in the world and how we can do it better together. We have our individual motivations for what we do and for the most part we are good at that, but what does it mean to work in a collective way – what is it that we collectively bring to the work and how can that be enhanced to its fullest impact? To ask the question and to help us learn more about the process, we chose to model our retreat on Otto Scharmer’s Theory U. The intention was to follow the journey of a U process, taking time collectively to See what we are doing and the dynamics at play, to Sense what that means for our work individually and collectively. We were then to experience Presencing, where we take a deeper dive into being present or sitting still with what we have learned and what we are experiencing. After spending time doing that we begin to crystallise what is emerging before moving to prototyping ideas and suggestions. The workshop design is intended to provide the opportunities for breakthroughs that transform the way groups work together in collaboration. Here’s how we chose to undertake the journey. In the Seeing and Sensing phase we chose to use Barrett Culture Survey, each person had responded to a questionnaire ahead of the retreat on the values that we each work by and also how we see values being lived in our partnership. The findings were mapped onto a seven level model. We discovered that we are an organisation heavily motivated by self improvement (continuous improvement) and collaboration. We discovered that we want to be an organisation having a greater impact in the world – an intentional and activist organisation. To explore the findings we undertook a dialogue lasting several hours. The next morning to dig more deeply into where we are we did yoga, meditation, and each of us wrote a poem called a Pantoum based on where were right now in our thoughts. Based on that we undertook inquiries in pairs based on one-way communication, a download without judgement or questions. To complete the Presencing phase we went into a forest and walked and talked – for hours. Luckily the venue was Tollymore Forest Park – in the foothills of the Mourne Mountains, the spectacular setting for Game of Thrones but also a peaceful and largely empty place. The walking and talking gave each person the chance to talk meaningfully to every other person, the only discipline laid down was to change talk partner every ten minutes, to ensure that everyone had the time to talk with every other person. When we made it back to our venue we created and shared a pictorial sketch of where we were at that stage. This helped us re-articulate the essence of all the great silences and conversations: what was crystallising. The day ended with us listing what had emerged. By now convergence was obvious. On the last day we opened the agenda right up using Open Space to allow people to propose the conversations that needed to happen. We planned together. The results of the week will be lived in our future. We committed to undertaking more innovative work, to refocusing actions on our skill base, to undertake personal development programmes, to enhance the way we meet, and doing this while having a focus on the business that underpins our work. Finding that we could lead ourselves through this journey reinforces the principles of self-management and self-organising that we preach in our work. We experienced an approach that is energising, meaningful, and a trusting way to work with depth and humanity but with concrete outcomes. In between the dialogues and thinking we took time to be in Ireland – walking, exploring the mountains, eating, playing, and getting lost in the world’s biggest Maze in Castlewellan. We got time to visit a pub and sing with traditional singers. Dutch culture meets Irish culture – electric atmosphere in an acoustic session.